VR Stalker © 1995 Antares Virtual Reality Systems. The United States has fallen into enemy hands. You're part of an elite group of pilots responsible for restoring our freedom, which means you will have to fly a variety of aircraft from your own Virtual Reality Simulator. 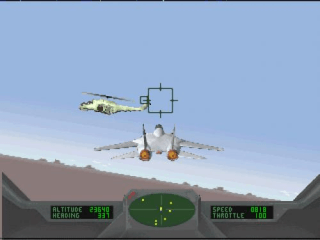 Experience incredibly realistic air combat as you explore a fully-mapped 3-D environment. And hear the roar of 20,000 pounds of thrust from your afterburners, just one of VR Stalker's many mind-numbing 3-D stereo sound effects. Real voice-overs accompany briefings for missions of over thirty levels of difficulty. Over 20 minutes of 3D animations and an original audio soundtrack let you live the unforgettable experience of this full combat flight simulator. Unit Description: The Reality Sled is a high-fidelity, 2 DOF hydraulic motion platform. It is fully compatible with the 3DO gaming system. ALL 3DO GAMES ARE SUPPORTED by the Reality Sled including ShockWave by Electronic Arts, VR Stalker by Morpheus Interactive, Total Eclipse by Crystal Dynamics. This game was developed by Morpheus Interactive.